This article is about the Christian holiday. For other uses, see Pentecost (disambiguation). The Christian holy day of Pentecost, which is celebrated on the seventh Sunday after Easter, commemorates the descent of the Holy Spirit upon the Apostles and other followers of Jesus Christ while they were in Jerusalem celebrating the Feast of Weeks, as described in the Acts of the Apostles (Acts 2:1–31). In Christian tradition, this event represents the birth of the early Church. In Eastern Christianity, Pentecost can also refer to the entire fifty days of Easter through Pentecost inclusive; hence the book containing the liturgical texts is called the "Pentecostarion". Since its date depends on the date of Easter, Pentecost is a moveable feast. The holy day is also called "White Sunday" or "Whitsunday", especially in the United Kingdom, where traditionally the next day, Whit Monday, was also a public holiday (now fixed by statute on the last Monday in May). In Germany Pentecost is called "Pfingsten" and often coincides with scholastic holidays and the beginning of many outdoor and springtime activities, such as festivals and organized outdoor activities by youth organizations. The Monday after Pentecost is a legal holiday in many European nations. The term Pentecost comes from the Greek Πεντηκοστή (Pentēkostē) meaning "fiftieth". It refers to the festival celebrated on the fiftieth day after Passover, also known as the "Feast of Weeks"[i] and the "Feast of 50 days" in rabbinic tradition. The Septuagint uses the term Pentēkostē to refer to the "Feast of Pentecost" only twice, in the deuterocanonical Book of Tobit and 2 Maccabees. The Septuagint writers also used the word in two other senses: to signify the year of Jubilee (Leviticus 25:10), an event which occurs every 50th year, and in several passages of chronology as an ordinal number. [ii] The term has also been used in the literature of Hellenistic Judaism by Philo of Alexandria and Josephus. In Judaism the Festival of Weeks (Hebrew: שבועות‎ Shavuot) was a harvest festival that was celebrated seven weeks and one day after the first Sabbath of the Feast of Unleavened Bread in Deuteronomy 16:9 or seven weeks and one day after the Sabbath in Leviticus 23:16. The Festival of Weeks was also called the feast of Harvest in Exodus 23:16 and the day of first fruits in Numbers 28:26. In Exodus 34:22 it is called the "firstfruits of the wheat harvest." The date for the "Feast of Weeks" originally came the day after seven full weeks following the first harvest of grain. In Jewish tradition the fiftieth day was known as the Festival of Weeks. The actual mention of fifty days comes from Leviticus 23:16. During the Hellenistic period, the ancient harvest festival also became a day of renewing the Noahic covenant, described in Genesis 9:8-17, which is established between God and "all flesh that is upon the earth". By this time, some Jews were already living in Diaspora. According to Acts 2:5-11 there were Jews from "every nation under heaven" in Jerusalem, possibly visiting the city as pilgrims during Pentecost. In particular the hoi epidemountes (οἱ ἐπιδημοῦντες) are identified as "visitors" to Jerusalem from Rome. This group of visitors includes both Jews and "proselytes" (προσήλυτος, prosēlytos); sometimes translated as "converts to Judaism", proselyte was a term used to describe non-Jews who adhered fully to the Mosaic laws, including circumcision. The list of nations represented in the biblical text includes Parthians, Medes, Elamites, Mesopotamia, Judaea,[iii] Cappadocia, Pontus, Asia, Phrygia, Pamphylia, Egypt, Cyrene, and those who were visiting from Rome. Scholars have speculated about a possible earlier literary source for the list of nations including an astrological list by Paul of Alexandria and various references to the Jewish diaspora by writers of the Second Temple era (particularly Philo of Alexandria). After the destruction of the temple in 70 AD offerings could no longer be brought to the Temple and the focus of the festival shifted from agriculture to the giving of the law on Sinai. It became customary to gather at synagogue and read the Book of Ruth and Exodus Chapters 19 and 20. The term Pentecost appears in the Septuagint as one of names for the Festival of Weeks. The Cenacle in Jerusalem is claimed to be the location of the Last Supper and Pentecost. The biblical narrative of the Pentecost includes numerous references to earlier biblical narratives like the Tower of Babel, and the flood and creation narratives from the Book of Genesis. It also includes references to certain theophanies, with certain emphasis on God's incarnate appearance on Sinai when the Ten Commandments were presented to Moses. Theologian Stephen Wilson has described the narrative as "exceptionally obscure" and various points of disagreement persist among bible scholars. Some biblical commentators have sought to establish that the οἶκος (house) given as the location of the events of in Acts 2:2 was one of the thirty halls of the Temple (called οίκοι), but the text itself is lacking in specific details. Richard C. H. Lenski and other scholars contend that the author of Acts could have chosen the word ἱερόν (sanctuary or temple) if this meaning were intended, rather than "house". Some semantic details suggest that the "house" could be the "upper room"(ὑπερῷον) mentioned in Acts 1:12-26 but there is no literary evidence to confirm the location with certainty and it remains a subject of dispute amongst scholars. The events of Acts Chapter 2 are set against the backdrop of the celebration of Pentecost in Jerusalem. There are several major features to the Pentecost narrative presented in the second chapter of the Acts of the Apostles. The author begins the narrative by noting that the disciples of Jesus "were all together in one place" on the "day of Pentecost" (ημέρα της Πεντηκοστής). The verb used in Acts 2:1 to indicate the arrival of the day of Pentecost carries a connotation of fulfillment. The narrative in Acts evokes the symbolism of Jesus' baptism in the Jordan River, and the start of his ministry, by explicitly connecting the earlier prophecy of John the Baptist to the baptism of the disciples with the Holy Spirit on the day of Pentecost. The timing of the narrative during the law giving festival of Pentecost symbolizes both continuity with the giving of the law, but also the central role of the Holy Spirit (understood as an aspect of Jesus Christ) for the early Church. The central role of Christ in Christian faith signified a fundamental theological separation from the traditional Jewish faith, which was grounded in the Torah and Mosaic Law. Peter's sermon in Acts 2:14–36 stresses the resurrection and exaltation. In his sermon, Peter quotes Joel 2:28–32 and Psalm 16 to indicate that first Pentecost marks the start of the Messianic Age. About one hundred and twenty followers of Christ (Acts 1:15) were present, including the Twelve Apostles (Matthias was Judas' replacement) (Acts 1:13, 26), Jesus' mother Mary, other female disciples and his brothers (Acts 1:14). While those on whom the Spirit had descended were speaking in many languages, the Apostle Peter stood up with the eleven and proclaimed to the crowd that this event was the fulfillment of the prophecy. In Acts 2:17, it reads: "'And in the last days,' God says, 'I will pour out my spirit upon every sort of flesh, and your sons and your daughters will prophesy and your young men will see visions and your old men will dream dreams." He also mentions (2:15) that it was the third hour of the day (about 9:00 am). Acts 2:41 then reports: "Then they that gladly received his word were baptized: and the same day there were added unto them about three thousand souls." Critical scholars believe some features of the narrative are theological constructions. Scholars believe that even if the Pentecost narrative is not literally true, it does signify an important event in the history of the early Church which enabled the rapid spread of Christianity. Within a few decades important congregations had been established in all major cities of the Roman Empire. Biblical commentator Lenski has noted that the use of the term "Pentecost" in Acts is a reference to the Jewish festival. He writes that a well-defined, distinct Christian celebration did not exist until later years, when Christians kept the name of "Pentecost" but began to calculate the date of the feast based on Easter rather than Passover. Scholars believe that Pope Leo I's Sermons 75-77 were given on Pentecost Sunday. In these sermons, dating to the 5th century, Leo discusses Macedonianism, which the Catholic Church denounced as heresy because it considered the Holy Spirit inferior to the Father and Son, thereby undermining the Trinity. He also denounces Manichean doctrine on the Holy Spirit, which taught that the Holy Spirit was present in Mani. Leo discusses other Catholic doctrine pertaining to the Holy Spirit, especially emphasizing the Spirit's relationship to the Father and Son of the Trinity and the Catholic Church. He draws an analogy between Jewish practices and the Christian feast day: "As once to the Hebrew people, freed from Egypt, the law was given on Mt. Sinai on the fiftieth day after the sacrifice of the lamb, so after the Passion of the Christ when the true Lamb of God was killed, on the fiftieth day from his Resurrection, the Holy Spirit came down on the apostles and the community of believers." Leo calls this the Second Covenant and says that it is "established by the same Spirit who has set up the first". He describes the descent of the Holy Spirit upon the disciples on Pentecost as the fulfillment of a "long-awaited promise". In Tobit 2:1 Pentēkostē is used as an alternate name for the Jewish holiday of Shavuot. The NABRE translation of this passage reads: "on our festival of Pentecost, the holy feast of Weeks". In the Eastern Orthodox Church, Pentecost is one of the Orthodox Great Feasts and is considered to be the highest ranking Great Feast of the Lord, second in rank only to Easter. The service is celebrated with an All-night Vigil on the eve of the feast day, and the Divine Liturgy on the day of the feast itself. Orthodox churches are often decorated with greenery and flowers on this feast day, and the celebration is intentionally similar to the Jewish holiday of Shavuot, which celebrates the giving of the Mosaic Law. The feast itself lasts three days. The first day is known as "Trinity Sunday"; the second day is known as "Spirit Monday" (or "Monday of the Holy Spirit"); and the third day, Tuesday, is called the "Third Day of the Trinity." The Afterfeast of Pentecost lasts for one week, during which fasting is not permitted, even on Wednesday and Friday. In the Orthodox Tradition, the liturgical color used at Pentecost is green, and the clergy and faithful carry flowers and green branches in their hands during the services. A popular tradition arose in both west and east of decorating the church with roses on Pentecost, leading to a popular designation of Pentecost as Latin: Festa Rosalia or "Rose Feast"; in Greek this became ρουσάλια (rousália). This led to Rusalii becoming the Romanian language term for the feast, as well as the Neapolitan popular designation Pasca rusata ("rosey Easter"). In modern times, the term in Greek refers to the eve of Pentecost, not Pentecost itself; or, in the case of Megara in Attica, to the Monday and Tuesday after Pascha, as roses are often used during the whole liturgical season of the Pentecostarion, not just Pentecost. John Chrysostom warned his flock not to allow this custom to replace spiritually adorning themselves with virtue in reception of the Fruits of the Holy Spirit. An extraordinary service called the "Kneeling Prayer" is observed on the night of Pentecost. This is a Vespers service to which are added three sets of long poetical prayers, the composition of Saint Basil the Great, during which everyone makes a full prostration, touching their foreheads to the floor (prostrations in church having been forbidden from the day of Pascha (Easter) up to this point). Uniquely, these prayers include a petition for all of those in hell, that they may be granted relief and even ultimate release from their confinement, if God deems this possible. All of the remaining days of the ecclesiastical year, until the preparation for the next Great Lent, are named for the day after Pentecost on which they occur (for example, the 13th Tuesday After Pentecost). The Orthodox icon of the feast depicts the Twelve Apostles seated in a semicircle (sometimes the Theotokos (Virgin Mary) is shown sitting in the center of them). At the top of the icon, the Holy Spirit, in the form of tongues of fire, is descending upon them. At the bottom is an allegorical figure, called Kosmos, which symbolizes the world. Although Kosmos is crowned with earthly glory he sits in the darkness caused by the ignorance of God. He is holding a towel on which have been placed 12 scrolls, representing the teaching of the Twelve Apostles. In the ancient Coptic Orthodox Church of Alexandria, Pentecost is one of the seven Major "Lord's Feasts". It is celebrated at the time of ninth hour (3:00 pm) on the Sunday of Pentecost by a special three-segment prayer known as the "Office of Genuflection (Kneeling Prayer)". This feast is followed with the "Apostles Fast" which has a fixed end date on the fifth of the Coptic month of Epip [which currently falls on July 12, which is equivalent to June 29, due to the current 13-day Julian-Gregorian calendar offset]. The fifth of Epip is the commemoration of the Martyrdom of St. Peter and Paul. The liturgical celebrations of Pentecost in Western churches are as rich and varied as those in the East. The main sign of Pentecost in the West is the color red. It symbolizes joy and the fire of the Holy Spirit. Priests or ministers, and choirs wear red vestments, and in modern times, the custom has extended to the lay people of the congregation wearing red clothing in celebration as well. Red banners are often hung from walls or ceilings to symbolize the blowing of the "mighty wind" and the free movement of the Spirit. The celebrations may depict symbols of the Holy Spirit, such as the dove or flames, symbols of the church such as Noah's Ark and the Pomegranate, or especially within Protestant churches of Reformed and Evangelical traditions, words rather than images naming for example, the gifts and Fruits of the Spirit. 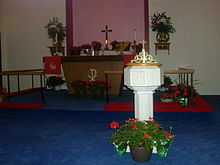 Red flowers at the altar/preaching area, and red flowering plants such as geraniums around the church are also typical decorations for Pentecost masses/services. These symbolize the renewal of life, the coming of the warmth of summer, and the growth of the church at and from the first Pentecost. In the southern hemisphere, for example, in southern Australia, Pentecost comes in the mellow autumntide, after the often great heat of summer, and the red leaves of the poinsettia have often been used to decorate churches then. These flowers often play an important role in the ancestral rites, and other rites, of the particular congregation. For example, in both Protestant and Catholic churches, the plants brought in to decorate for the holiday may be each "sponsored" by individuals in memory of a particular loved one, or in honor of a living person on a significant occasion, such as their Confirmation day. In the German speaking lands, in Central Europe, and wherever the people of these nations have wandered, green branches are also traditionally used to decorate churches for Pentecost. Birch is the tree most typically associated with this practice in Europe, but other species are employed in different climates. The singing of Pentecost hymns is also central to the celebration in the Western tradition. Hymns such as Martin Luther's "Komm, Heiliger Geist, Herre Gott" (Come, Holy Spirit, God and Lord), Charles Wesley's "Spirit of Faith Come Down" and "Come Holy Ghost Our Hearts Inspire" or Hildegard von Bingen's "O Holy Spirit Root of Life" are popular. Some traditional hymns of Pentecost make reference not only to themes relating to the Holy Spirit or the church, but to folk customs connected to the holiday as well, such as the decorating with green branches. Other hymns include "Oh that I had a Thousand Voices" ("O daß ich tausend Zungen hätte") by German, Johann Mentzer Verse 2: "Ye forest leaves so green and tender, that dance for joy in summer air…" or "O Day Full of Grace" ("Den signede Dag") by Dane, N. F. S. Grundtvig verse 3: "Yea were every tree endowed with speech and every leaflet singing…". As Pentecost closes the Easter Season in the Roman Catholic Church, the dismissal with the double alleluia is sung at the end of Mass. The Paschal Candle is removed from the sanctuary at the end of the day. In the Roman Catholic Church, Veni Sancte Spiritus is the sequence hymn for the Day of Pentecost. This has been translated into many languages and is sung in many denominations today. As an invocation of the Holy Spirit, Veni Creator Spiritus is sung during liturgical celebrations on the feast of Pentecost. Trumpeters or brass ensembles are often specially contracted to accompany singing and provide special music at Pentecost services, recalling the Sound of the mighty wind. While this practice is common among a wide spectrum of Western denominations (Eastern Churches do not employ instrumental accompaniment in their worship) it is particularly typical, and distinctive to the heritage of the Moravian Church. Another custom is reading the appointed Scripture lessons in multiple foreign languages recounting the speaking in tongues recorded in Acts 2:4–12. In the Middle Ages, cathedrals and great churches throughout Western Europe were fitted with a peculiar architectural feature known as a Holy Ghost hole: a small circular opening in the roof that symbolized the entrance of the Holy Spirit into the midst of the congregation. At Pentecost, these Holy Ghost holes would be decorated with flowers, and sometimes a dove figure lowered through into the church while the narrative of Pentecost was read. Holy Ghost holes can still be seen today in European churches such as Canterbury Cathedral. Similarly, a large two dimensional dove figure would be, and in some places still is, cut from wood, painted, and decorated with flowers, to be lowered over the congregation, particularly during the singing of the sequence hymn, or Veni Creator Spiritus. In other places, particularly Sicily and the Italian peninsula, rose petals were and are thrown from the galleries over the congregation, recalling the tongues of fire. In modern times, this practice has been revived, and adapted as well, to include the strewing of origami doves from above or suspending them, sometimes by the hundreds, from the ceiling. In some cases, red fans, or red handkerchiefs, are distributed to the congregation to be waved during the procession, etc. Other congregations have incorporated the use of red balloons, signifying the "Birthday of the Church". These may be borne by the congregants, decorate the sanctuary, or released all at once. For some Protestants, the nine days between Ascension Day, and Pentecost are set aside as a time of fasting and universal prayer in honor of the disciples' time of prayer and unity awaiting the Holy Spirit. Similarly among Roman Catholics, special Pentecost novenas are prayed. The Pentecost Novena is considered the first novena, all other novenas prayed in preparation of various feasts deriving their practice from those original nine days of prayer observed by the disciples of Christ. While the Eve of Pentecost was traditionally a day of fasting for Catholics, contemporary canon law no longer requires it. Both Catholics and Protestants may hold spiritual retreats, prayer vigils, and litanies in the days leading up to Pentecost. In some cases vigils on the Eve of Pentecost may last all night. Pentecost is also one of the occasions specially appointed for the Lutheran Litany to be sung. From the early days of Western Christianity, Pentecost became one of the days set aside to celebrate Baptism. In Northern Europe Pentecost was preferred even over Easter for this rite, as the temperatures in late spring might be supposed to be more conducive to outdoor immersion as was then the practice. It is proposed that the term Whit Sunday derives from the custom of the newly baptized wearing white clothing, and from the white vestments worn by the clergy in English liturgical uses. The holiday was also one of the three days each year (along with Christmas and Easter) Roman Catholics were required to confess and receive Holy Communion in order to remain in good ecclesiastical standing. Holy Communion is likewise often a feature of the Protestant observance of Pentecost as well. It is one of the relatively few Sundays some Reformed denominations may offer the communion meal, and is one of the days of the year specially appointed among Moravians for the celebration of their Love Feasts. Ordinations are celebrated across a wide array of Western denominations at Pentecost, or near to it. In some denominations, for example the Lutheran Church, even if an ordination or consecration of a deaconess is not celebrated on Pentecost, the liturgical color will invariably be red, and the theme of the service will be the Holy Spirit. Above all, Pentecost is a day for the Confirmation celebrations of youths. Flowers, the wearing of white robes, or white dresses recalling Baptism, rites such as the laying on of hands, and vibrant singing play prominent roles on these joyous occasions, the blossoming of Spring forming an equal analogy with the blossoming of youth. The typical image of Pentecost in the West is that of the Virgin Mary seated centrally and prominently among the disciples with flames resting on the crowns of their heads. Occasionally, parting clouds suggesting the action of the "mighty wind", rays of light and the Dove are also depicted. Of course, the Western iconographic style is less static and stylized than that of the East, and other very different representations have been produced, and, in some cases, have achieved great fame such as the Pentecosts by Titian, Giotto, and el Greco. St. Paul already in the 1st century notes the importance of this festival to the early Christian communities. (See: Acts 20:16 & 1 Corinthians 16:8) Since the lifetime of some who may have been eyewitnesses, annual celebrations of the descent of the Holy Spirit have been observed. Before the Second Vatican Council Pentecost Monday as well was a Holy Day of Obligation during which the Catholic Church addressed the newly baptized and confirmed. After the Council, Pentecost Monday is no longer solemnized. Nevertheless, Pentecost Monday remains an official festival in many Protestant churches, such as the (Lutheran) Church of Sweden, the Evangelical Lutheran Church of Finland, and others. In the Byzantine Catholic Rite Pentecost Monday is no longer a Holy Day of Obligation, but rather a simple holiday. In the Extraordinary Form of the liturgy of the Roman Catholic Church, as at Easter, the liturgical rank of Monday and Tuesday of Pentecost week is a Double of the First Class and across many Western denominations, Pentecost is celebrated with an octave culminating on Trinity Sunday. However, in the modern Roman Rite (Ordinary Form), Pentecost ends after Evening Prayer on the feast day itself, with Ordinary Time resuming the next day. Marking the festival's importance, in several denominations, such as the Lutheran, Episcopal, and United Methodist churches, and formerly in the Roman Catholic Church, all the Sundays from the holiday itself until Advent in late November or December are designated the 2nd, 3rd, Nth, Sunday after Pentecost, etc. Throughout the year, in Roman Catholic piety, Pentecost is the third of the Glorious Mysteries of the Holy Rosary, as well as being one of the Stations of the Resurrection or Via Lucis. Across denominational lines Pentecost has been an opportunity for Christians to honor the role of the Holy Spirit in their lives, and celebrate the birth of the Church in an ecumenical context. The Lutheran church of the Baroque observed three days of Pentecost. Some composers wrote sacred cantatas to be performed in the church services of these days. Johann Sebastian Bach composed several cantatas for Pentecost, including Erschallet, ihr Lieder, erklinget, ihr Saiten! BWV 172, in 1714 and Also hat Gott die Welt geliebt, BWV 68, in 1725. Gottfried Heinrich Stölzel wrote cantatas such as Werdet voll Geistes (Get full of spirit) in 1737. Mozart composed an antiphon Veni Sancte Spiritus in 1768. Olivier Messiaen composed an organ mass Messe de la Pentecôte in 1949/50. In 1964 Fritz Werner wrote an oratorio for Pentecost Veni, sancte spiritus (Come, Holy Spirit) on the sequence Veni Sancte Spiritus, and Jani Christou wrote Tongues of Fire, a Pentecost oratorio. Richard Hillert wrote a Motet for the Day of Pentecost for choir, vibraphone, and prepared electronic tape in 1969. Violeta Dinescu composed Pfingstoratorium, an oratorio for Pentecost for five soloists, mixed chorus and small orchestra in 1993. Daniel Elder's 21st century piece, "Factus est Repente", for a cappella choir, was premiered in 2013. In France it was customary to blow trumpets during Divine service, to recall the sound of the mighty wind which accompanied the Descent of the Holy Spirit. In the north west of England, church and chapel parades called Whit Walks take place at Whitsun (sometimes on Whit Friday, the Friday after Whitsun). Typically, the parades contain brass bands and choirs; girls attending are dressed in white. Traditionally, Whit Fairs (sometimes called Whitsun Ales) took place. Other customs such as morris dancing and cheese rolling are also associated with Whitsun. "Whitsunday" has been the name of the day in the Church of England. (The Book of Common Prayer only once uses the word "Pentecost" for the festival. Though some[who?] think that name derives from white clothes worn by newly baptised in Eastertide, it may well be seen as derived from "wit", hence "wisdom", the reference being to Holy Wisdom (Sancta Sophia, Hagia Sophia), referred to in Proverbs and the Book of Wisdom, with which the Holy Spirit has often been identified. In Finland there is a saying known virtually by everyone which translates as "if one has no sweetheart until Pentecost, he/she will not have it during the whole summer." In Port Vila, the capital of Vanuatu, people originating from Pentecost Island usually celebrate their island's name-day with a special church service followed by cultural events such as dancing. In Ukraine the springtime feast day of Zeleni Sviata became associated with the Pentecost. (The exact origin of the relationship is not known). The customs for the festival were performed in the following order: first, home and hearth would be cleaned; second, foods were prepared for the festival; finally, homes and churches were decorated with wildflowers and various types of green herbs and plants. A seven course meal may have been served as the Pentecost feast which may have included traditional dishes such as cereal with honey (kolyvo), rice or millet grains with milk, sauerkraut soup (kapusniak), chicken broth with handmade noodles (iushka z zaterkoiu), cheese turnovers (pyrizhky syrom), roast pork, buckwheat cakes served with eggs and cheese (blyntsi), and baked kasha. The earliest possible date is May 10 (as in 1818 and 2285). The latest possible date is June 13 (as in 1943 and 2038). The day of Pentecost is seven weeks after Easter Sunday: that is to say, the fiftieth day after Easter inclusive of Easter Sunday. Pentecost may also refer to the 50 days from Easter to Pentecost Sunday inclusive of both. Because Easter itself has no fixed date, this makes Pentecost a moveable feast. While Eastern Christianity treats Pentecost as the last day of Easter in its liturgies, in the Roman liturgy it is usually a separate feast. The fifty days from Easter Sunday to Pentecost Sunday may also be called Eastertide. Since Pentecost itself is on a Sunday, it is automatically considered to be a public holiday in countries with large Christian denominations. Pentecost Monday is a public holiday in many European countries including Andorra, Austria, Belgium, Cyprus, Denmark, France, Germany, Greece, Hungary, Iceland, Liechtenstein, Luxembourg, the Netherlands, Norway, Romania (since 2008), (most parts of) Switzerland, Ukraine and also in the African nations Senegal, Benin and Togo. In Sweden it was also a public holiday, but Pentecost Monday (Annandag Pingst) was replaced by Swedish National Day on June 6, by a government decision on December 15, 2004. In Italy and Malta, it is no longer a public holiday. It was a public holiday in Ireland until 1973, when it was replaced by Early Summer Holiday on the first Monday in June. In the United Kingdom the day is known as Whit Monday, and was a bank holiday until 1967 when it was replaced by the Spring Bank Holiday on the last Monday in May. In France, following reactions to the implementation of the Journée de solidarité envers les personnes âgées, Pentecost Monday has been reestablished as a regular (not as a working) holiday on May 3, 2005. German poet Johann Wolfgang von Goethe declared Pentecost "das liebliche Fest" – the lovely Feast, in a selection by the same name in his Reineke Fuchs. "Pfingsten, das liebliche Fest", speaks of Pentecost as a time of greening and blooming in fields, woods, hills, mountains, bushes and hedges, of birds singing new songs, meadows sprouting fragrant flowers, and of festive sunshine gleaming from the skies and coloring the earth – iconic lines idealizing the Pentecost holidays in the German-speaking lands. Further, Goethe records an old peasant proverb relating to Pentecost in his "Sankt-Rochus-Fest zu Bingen" – Ripe strawberries at Pentecost mean a good wine crop. Alexandre Dumas, père mentions of Pentecost in Twenty Years After (French: Vingt ans après), the sequel to The Three Musketeers. A meal is planned for the holiday, to which La Ramée, second in command of the prison, is invited, and by which contrivance, the Duke is able to escape. He speaks sarcastically of the festival to his jailor, foreshadowing his escape : "Now, what has Pentecost to do with me? Do you fear, say, that the Holy Ghost may come down in the form of fiery tongues and open the gates of my prison?" William Shakespeare mentions Pentecost in a line from Romeo and Juliet Act 1, Scene V. At the ball at his home, Capulet speaks in refuting an overestimate of the time elapsed since he last danced: "What, man? 'Tis not so much, 'tis not so much! 'Tis since the nuptial of Lucentio, Come Pentecost as quickly as it will, Some five-and-twenty years, and then we mask'd." Note here the allusion to the tradition of mumming, Morris dancing and wedding celebrations at Pentecost. A Western depiction of the Pentecost, painted by Jean II Restout, 1732. ^ The Greek term used for Shavuot in the Septuagint translation of Deuteronomy 16:10 and Exodus 34:22 is ἑορτὴν ἑβδομάδων (heortēn hebdomdádōn), often translated into English as "Festival of Weeks." ^ As part of the phrase ἐπ᾽ αὐτὴν ἔτους πεντηκοστοῦ καὶ ἑκατοστοῦ(ep autēn etous pentēkastou kai hekatostou, "in the hundred and fiftieth year", or some variation of the phrase in combination with other numbers to define a precise number of years, and sometimes months. See: "... in the hundred and fiftieth year..."1 Maccabees 6:20, "In the hundred and one and fiftieth year..."1 Maccabees 7:1, " Also the first month of the hundred fifty and second year..." 1 Maccabees 9:3, with other examples at 1 Maccabees 9:54, and 2 Maccabees 14:4. ^ There is significant disagreement amongst modern scholars about the interpretation of "Judea" in Acts 2:9. Tertullian and Augustine have rendered the "Judea" of Acts 2:9 as Armeniam (Armenia), while Jerome has called it Syria, and John Chrysostom has associated it with India. Additional possibilities including Cilicia, Ionia and Lydia have been suggested by modern scholars. ^ a b Bratcher, Robert G; Hatton, Howard (2000). A handbook on Deuteronomy. New York: United Bible Societies. ISBN 978-0-8267-0104-6. ^ a b c Gerhard, Kittel; Friedrich, Gerhard; Bromiley, Geoffrey William, eds. (2006). "Pentecost". Theological dictionary of the New Testament. Translated by Geoffrey William Bromiley. Grand Rapids, Michigan: Eerdmans. ISBN 978-0-8028-2243-7. ^ a b c Bromiley, Geoffrey William, ed. (2009). "Pentecost". The International standard Bible encyclopedia (2 ed.). Grand Rapids, Michigan: W.B. Eerdmans. ^ "Septuagint (LXX), 1 Maccabees 6:20". academic-bible.com: The Scholarly Portal of the German Bible Society. German Bible Society. Retrieved 9 June 2017. ^ a b Balz, Horst Robert; Schneider, Gerhard (1994). Exegetical dictionary of the New Testament. ISBN 978-0-8028-2803-3. ^ a b Keil, Carl Friedrich; Delitzsch, Franz (2011). Commentary on the Old Testament. Peabody, Massachusetts: Hendrickson Publishers. ISBN 978-0-913573-88-4. ^ a b Gaebelein, Frank E (1984). The expositors Bible commentary with the New International Version of the Holy Bible in twelve volum. Grand Rapids, MI: Zondervan. ISBN 978-0-310-36500-6. ^ NIV archaeological study Bible an illustrated walk through biblical history and culture : New International Version. Grand Rapids, Mich.: Zondervan. 2005. ISBN 978-0-310-92605-4. ^ a b c d Jansen, John Frederick (1993). "Pentecost". The Oxford Companion to the Bible. Oxford University Press. doi:10.1093/acref/9780195046458.001.0001. ISBN 978-0-19-504645-8. Retrieved 2018-12-02. ^ a b c d e Longenecker, Richard N. (2017-03-07). Acts. Zondervan. ISBN 978-0-310-53203-3. ^ Zondervan (2010-11-23). NIV, Archaeological Study Bible: An Illustrated Walk Through Biblical History and Culture. Zondervan. ISBN 978-0-310-87018-0. ^ a b c Gilbert, Gary (2002). "The List of Nations in Acts 2: Roman Propaganda and the Lukan Response". Journal of Biblical Literature. 121 (3): 497–529. doi:10.2307/3268158. ISSN 0021-9231. JSTOR 3268158. ^ Maʻoz, Moshe; Nusseibeh, Sari (2000-01-01). Jerusalem: Points Beyond Friction, and Beyond. BRILL. ISBN 978-90-411-8843-4. ^ a b c d Lenski, R. C. H. (2008). Commentary on the New Testament: The Interpretation of the Acts of the Apostles 1-14. Augsburg Fortress. ISBN 978-1-4514-1677-0. ^ Vine, W. E. (2003-05-01). Vine's Expository Dictionary of the Old & New Testament Words. Thomas Nelson Incorporated. ISBN 978-0-7852-5054-8. ^ a b Calvin, John. Commentary on Acts - Volume 1 - Christian Classics Ethereal Library. Retrieved 2018-12-02. ^ "Bible Gateway passage: Acts 1:13–15, Acts 1:26 – King James Version". Bible Gateway. ^ "Joel 2:28–29". Biblegateway.com. Retrieved 2013-12-21. ^ "Acts 2:41". Biblegateway.com. Retrieved 2013-12-21. ^ a b Freeland, Jane Patricia; Conway, Agnes Josephine (1996). "Pentecost". Sermons (The Fathers of the Church, Volume 93). Catholic University of America Press. pp. 330–351. ISBN 978-0-8132-0093-4. JSTOR j.ctt32b3ts.15. Retrieved 2018-12-03. ^ Bullard, Roger Aubrey; Hatton, Howard (2001). A handbook on Tobit and Judith. New York: United Bible Societies. ISBN 978-0-8267-0200-5. ^ All troparia and kontakia · All lives of saints. "Trinity Week – 3rd Day of the Trinity". Ocafs.oca.org. Retrieved 2013-12-21. ^ a b "Byzantine Catholics and the Feast Of Pentecost: "Your good Spirit shall lead me into the land of righteousness. Alleluia, Alleluia, Alleluia!"". archpitt.org. Byzantine Catholic Archdiocese of Pittsburgh. 2015-12-28. Retrieved 9 June 2017. ^ "ρουσάλια" [rousalia]. Enacademic.com – Greek Dictionary (in Greek). ^ Pentecost—Prayers of Kneeling Archived 2013-11-02 at the Wayback Machine. See the third prayer. ^ a b "St. Catherine of Sweden Roman Catholic Church – Bulletin". StCatherineofSweden.org. Archived from the original on 2009-08-29. Retrieved 2010-05-17. ^ "200–299 TLH Hymns". Lutheran-hymnal.com. Retrieved 2010-05-17. 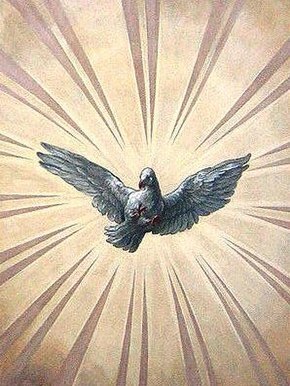 ^ "Come, Holy Ghost, God and Lord". Lutheran-hymnal.com. Retrieved 2010-05-17. ^ "HymnSite.com's Suggested Hymns for the Day of Pentecost (Year C)". Hymnsite.com. Retrieved 2010-05-17. ^ "Spirit of Faith, Come Down". Hymntime.com. Retrieved 2010-05-17. ^ "Come, Holy Ghost, Our Hearts Inspire". Hymntime.com. Retrieved 2010-05-17. ^ "O Holy Spirit, Root of Life". Hymnsite.com. Retrieved 2010-05-17. ^ "Texts > O Holy Spirit, root of life". Hymnary.org. Retrieved 2010-05-17. ^ "Hymns and Hymnwriters of Denmark | Christian Classics Ethereal Library". Hymnary.com. 2009-08-11. Retrieved 2010-05-17. ^ "O That I Had a Thousand Voices". Hymntime.com. Retrieved 2010-05-17. ^ "O daß ich tausend Zungen hätte gospel christian songs free mp3 midi download". Ingeb.org. Retrieved 2010-05-17. ^ "Lutheran Worship Online Hymnal – section MO". Lutheranhymnal.com. Retrieved 2010-05-17. ^ "Rhabanus Maurus". Hymntime.com. Retrieved 2010-05-17. ^ "Catholic Encyclopedia: Veni Creator Spiritus". Newadvent.org. 1912-10-01. Retrieved 2010-05-17. ^ "Moravian Music Foundation". MoravianMusic.org. Retrieved 2010-05-17. ^ Nelson, Gertrud Muller (1986). To Dance With God: Family Ritual and Community Celebration. Paulist Press. p. 193. ISBN 978-0-8091-2812-9. Retrieved 2010-05-17. ^ "The Episcopal Church and Visual Arts". Ecva.org. Retrieved 2010-05-17. ^ (P. Drews.). "Litany". Ccel.org. Retrieved 2010-05-17. ^ "Catholic Encyclopedia: Frequent Communion". Newadvent.org. Retrieved 2010-05-17. 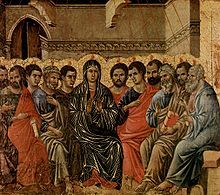 ^ "Catholic Encyclopedia: Pentecost". Newadvent.org. 1912-10-01. Retrieved 2010-05-17. ^ "Pentecost: All About Pentecost (Whitsunday)!". ChurchYear.net. Retrieved 2010-05-17. ^ "Catholics at Monash: Photos of Ecumenical Pentecost Celebrations". MonashCatholics.blogspot.com. 2007-06-15. Retrieved 2010-05-17. ^ "Whit Friday: Whit Walks". Whitfriday.brassbands.saddleworth.org. 2011-06-18. Archived from the original on 2008-05-09. Retrieved 2013-12-21. ^ "'Feasts and Festivals': 23 May: Whitsun Ales". Feastsandfestivals.blogspot.com. 2010-05-23. Retrieved 2013-12-21. ^ "Cheese Rolling". BBC. 30 May 2005. Archived from the original on 31 May 2013. Retrieved 31 May 2013. CS1 maint: BOT: original-url status unknown (link). ^ Farley, Marta Pisetska (1990). "Pentecost". Festive Ukranian Cooking. Festive Ukranian Cooking. University of Pittsburgh Press. pp. 78–84. ISBN 978-0-8229-3646-6. JSTOR j.ctt7zwbs9.11. Retrieved 2018-12-03. ^ "Pentecost". Encyclopedia Britannica. Archived from the original on 2017-07-11. Retrieved 2017-06-03. Pentecost... major festival in the Christian church, celebrated on the Sunday that falls on the 50th day after Easter. ^ Grassie, William (2013-03-28). "Easter: A Moveable Feast". HuffPost. Archived from the original on 2017-04-13. Retrieved 2017-06-04. ^ a b (U.S.A.), Presbyterian Church (1992-01-01). Liturgical Year: The Worship of God. Westminster John Knox Press. ISBN 978-0-664-25350-9. ^ "Das Gedicht Pfingsten, das liebliche Fest... von Johann Wolfgang von Goethe". gedichte-fuer-alle-faelle.de. ^ "Nachrichten – Kultur". Projekt Gutenberg.spiegel.de. 2009-08-17. Retrieved 2010-05-17. ^ "Romeo and Juliet Text and Translation – Act I, Scene V". Enotes.com. Retrieved 2010-05-17. 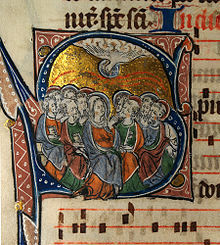 Wikimedia Commons has media related to Pentecost.